Blowers are devices with a series of spinning blades that are used to generate airflow in a variety of applications. Blowers are important to almost all bulk handling systems because they can be used not only with dry bulk goods but also to power pneumatic conveyors by creating pressure changes for material transfer. An appropriately sized blower can be used in a pneumatic conveyor (large or small) to transport materials through a bulk handling system. High velocity fans or high-pressure blowers are used in bulk material handling facilities to dry materials before they are packaged or stored. 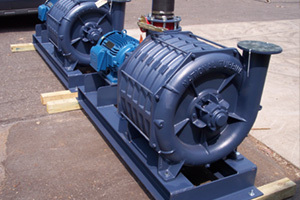 High-pressure blowers can also be used to discharge materials at an optimal rate. Blowers for bulk material handling systems come in two main types: axial blowers and centrifugal blowers. Axial blowers are built with several curved blades that spin on an axis at high speeds. The circular motion of the curved blades creates an imbalance in the surrounding air pressure. This is what causes airflow and allows for transfer in some pneumatic conveyors. A centrifugal blower, also known as a radial blower, is another broad category of blowers that creates airflow in a similar way. 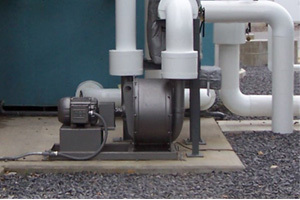 However, centrifugal blowers use a different mechanism to create an imbalance in the air pressure. The blades actually spin forward within an enclosure (annular housing). This rapid forward motion in a confined space causes air to be sucked into the housing. The air is pressurized when it leaves the blower and is discharged through a chute or tube. Axial and radial blowers can operate at the same RPM, but the centrifugal force of radial blowers makes them capable of producing higher-pressure flow. These blowers can be mounted to pull air into a tube from the side, which is perfect in bulk handling systems where material must pass through sharp angles and curves in the pipe. Blowers can be used to handle both wet and dry bulk material solids. Of course, wet bulk materials usually weigh more due to their moisture content, so higher pressure air flow will be required to move them through a pneumatic system. One interesting and unique application of blowers is in the landscaping industry. Truck blowers can be mounted onto a truck or trailer’s storage tank and fitted with a long, wide hose. This type of blower can be used to blow mulch into gardens. A tool like this gives landscapers a quick and easy way to mulch flowerbeds and other areas on a property. For loading and unloading of bulk materials into or out of tanks, blowers can be used to create enough of a pressurized air flow to move materials between point A and point B in a system. 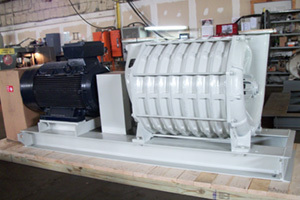 A simple blower may also be used to dry bulk materials as they move along on a conveyor belt. The air does not need to be highly pressurized in this case, and it may be heated slightly or kept at room temperature to speed up the drying process. Because so many different industries handle materials in bulk at some point during their production process, blowers are highly sought after by manufacturers around the world. Most blower manufacturers are able to consult with their customers to offer the best possible blower for an existing bulk material handling system. Considerations like speed, particle density, volume, etc. are all very important when selecting the right blower for an application. In some cases, manufacturers create entire bulk material handling systems, so they know exactly which blowers will be best in a particular facility. From plastics to chemical handling to food processing and beyond, most industries would not be able to handle bulk materials efficiently without blowers. Blowers Blowers are devices with a series of spinning blades that are used to generate airflow in a variety of applications. Blowers are important to almost all bulk handling systems because they can be used not only with dry bulk goods but also to power pneumatic conveyors by creating pressure changes for material transfer. An appropriately sized blower can be used in a pneumatic conveyor (large or small) to transport materials through a bulk handling system.